Since the 1970s, the closure of mines, mills, and factories has marked a rupture in working-class lives. 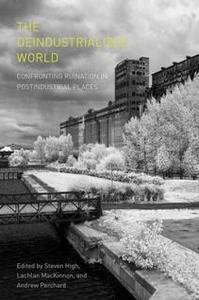 The Deindustrialized World interrogates the process of industrial ruination, from the first impact of layoffs in metropolitan cities, suburban areas, and single-industry towns to the shock waves that rippled outward, affecting entire regions, countries, and beyond. Scholars from five nations share personal stories of ruin and ruination and ask others what it means to be working class in a postindustrial world. Together, they open a window on the lived experiences of people living at ground zero of deindustrialization, revealing its layered impacts and examining how workers, environmentalists, activists, and the state have responded to its challenges.